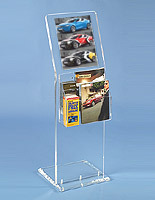 This mobile acrylic poster rack is a double-sided stand with 5 pockets on one side. 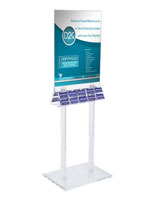 The literature display features a 22” x 28” graphics holder on a clear plastic base. 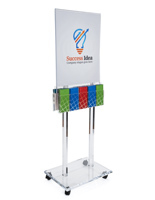 The poster rack with locking casters has a wheel on each foot to allow for easy movement around an office or business space. 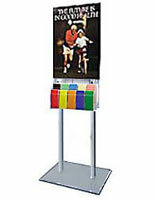 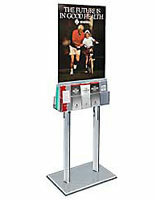 The literature display stands 67” tall to be at a proper height for the average-sized viewer. 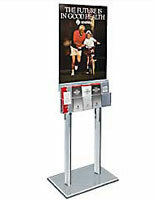 The rack ships to customers flat, but is easy to assemble and comes with all the necessary hardware for completing the task. 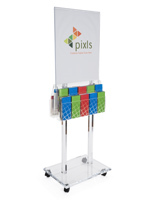 There are adjustable pegs in the plastic holder so that both 4” and 8.5” wide reading materials can be displayed.